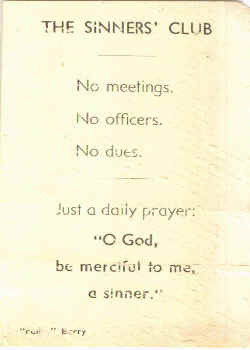 This picture was mailed to my mother January 28th, 1945 by our Chaplin Father Joseph D. Barry. 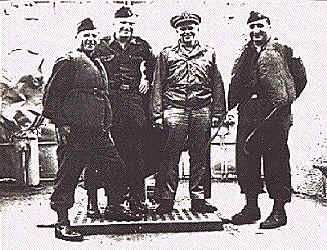 On his left is General Charles Ankorn who was the 157th Regimental Commander (then a colonel). Captain Father Joseph D. Barry was awarded the Silver Star for bravery. After 54 years, I can still see Father Barry administering last rights to soldiers in the field while enemy shells exploded all around him. He was a dedicated priest and I will never forget him. On September 24th, 1943, a jeep carrying Colonel Charles Ankorn struck a mine near the front lines. Neither the driver or his bodyguard was seriously injured but Colonel Ankorn's right leg was mangled and had to be amputated. He was sadly missed, for more than any other man he had built up the fighting qualities of the 157th. 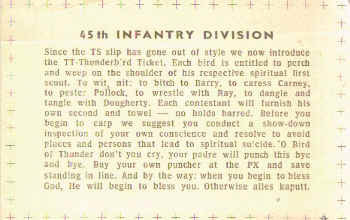 The new Thunderbird Ticket that replaced the old TS slip. This is a picture of the Hofbrauhaus in Munich, Germany where one Adolph Hitler led his gang of bullies in his first abortive attempt to unseat organized government by violence. His Putsch from this beer hall was a dismal failure and ended with Der Fuerher flat on his face dodging bullets a few blocks from the spot where he declared to his followers that he would win or die. On April 30, 1945, Munich fell before elements of the 45th and 42nd divisions. 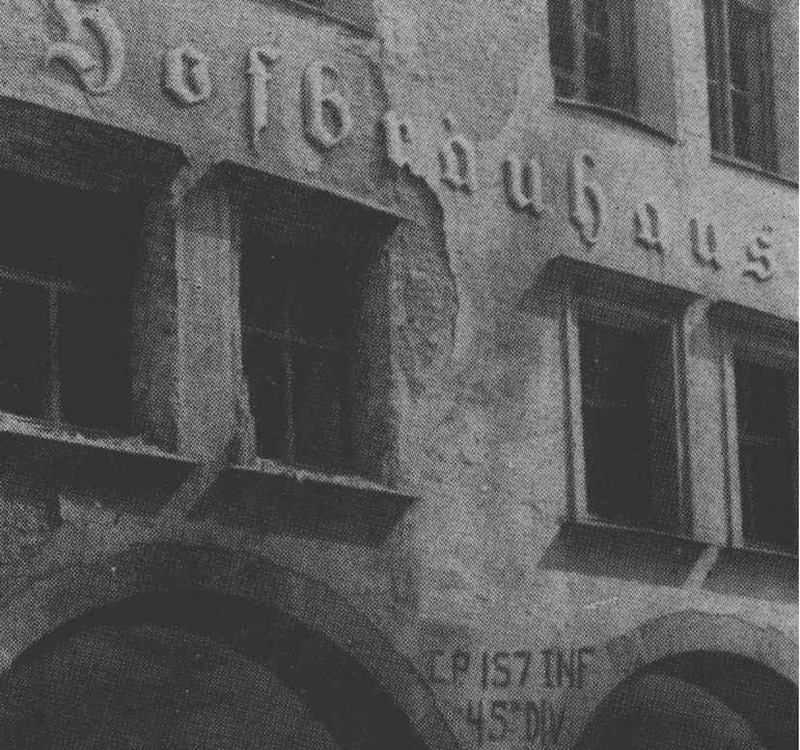 The 157th Infantry won the race for the Hofbrauhaus and their CP sign was the first to be placed on it. This caption was taken from the 157th Book, Eager for Duty. Picture was taken from the Forty Fifth Division Book. 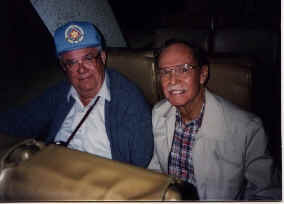 Since George was the only one who could speak German, he acted as the interpreter and negotiator in the surrender of our troops at Reipertswiller. 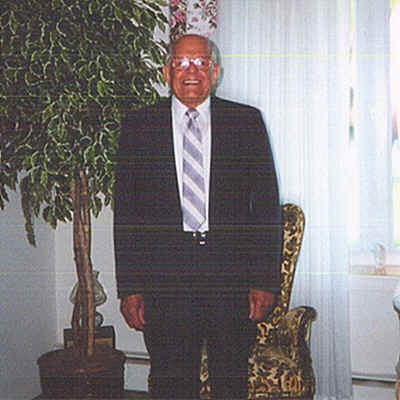 George was seriously wounded and credits a German surgeon for saving his life. Bob and I shared the same foxholes from 8/15/44 to 1/15/45. 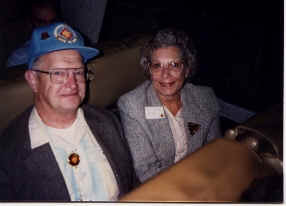 I was hit on 1/15/45 and Bob was taken prisoner on 1/20/45. 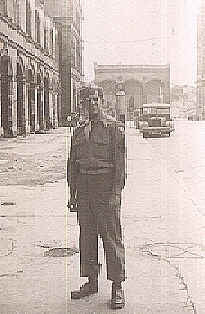 Ken was a platoon sergeant Co. "K" and was taken prisoner 1/20/45. 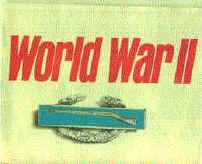 Harry was a machine gunner with Co "K", 157th. He was seriously wounded at Reipertswiller. His left arm was riddled by German machine gun fire and had to be amputated. 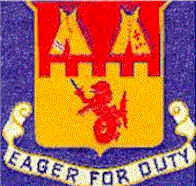 James King was a member of Co. "M", a heavymachine gunner attached to Co. "L". Jim who was a corporal became squad leader, platoon sergeant, and since there was no officer, he was also the platoon leader. He took control and moved his men forward. 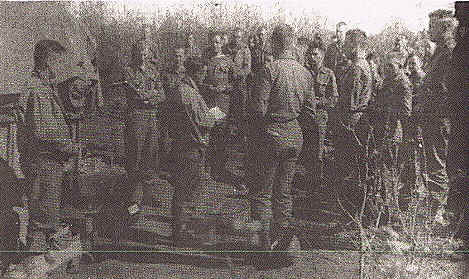 Jim was taken prisoner at Reipertswiller on 1/20/45. 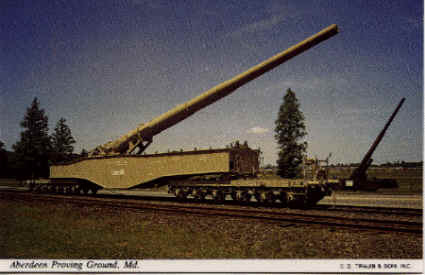 This railway artillery piece is on display at the Aberdeen Proving Ground in Aberdeen, Maryland. Picture and caption is taken from the Aberdeen Proving Ground brochure. 550-pound shell. The German Leopold Gun was the largest weapon which lobbed shells at American troops at "Anzio Beach". An aura of mystery surrounded the employment of the gun. To the bewilderment of allied officials who knew the approximate location of the Leopold, the gun could not be silenced. Repeated bomber and naval attacks failed. It wasn't until the Allies broke out of the "Anzio Beachhead" and sent the Germans scurrying that the secret was revealed. The Leopold supported by 24 railcar wheels, was mounted on railroad tracks which led in and out of mountain tunnels. When not firing, the gun was rolled back into the tunnels out of the sight of Allied reconnaissance. Because bombs had destroyed Italian rail systems, the Germans were forced to leave the Leopold and its twin gun "Robert" behind. Although both guns had been extensively damaged, Allied forces were able to salvage the Leopold and after reconstruction of the railway, moved the gun to Naples for shipment to the United States. "Anzio Annie" as the gun was known to the Allied troops at Anzio, is the only German railroad gun known to have survived World War II. "Hope you get as big a laugh out of this as I did. You and Bob appear to be real serious. A sixty mm is what got me at Reipertswiller January 18, 1945. Your good ole' buddy, way down south in Florida." Please refer to the CMOH page. 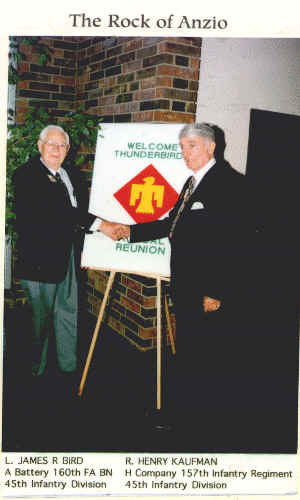 Jim Bird served with "A" Battery, 160th FA Bn. 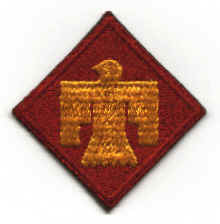 attached to the 45th Infantry Division. He participated in 8 campaigns with over 500+ days of combat. 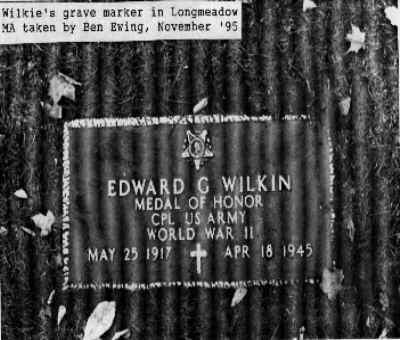 He was the recipient of the Silver Star, 2 Purple Hearts, The ETO Medal, German Occupational Medal, etc. 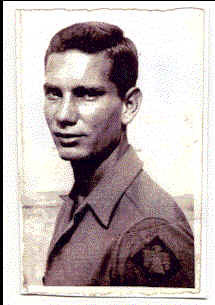 Henry Kaufman served in "H" Company, Second Bn., 157th Regiment, 45th Infantry Division. He was taken prisoner on Anzio Beachhead and spent 15 months in various POW camps, and five days at Camp Dachau. 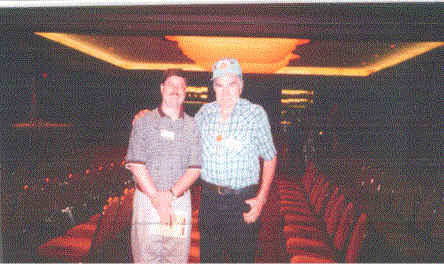 This picture taken at the 157th Regiment Reunion in Philadelphia, Sept. - 2000. 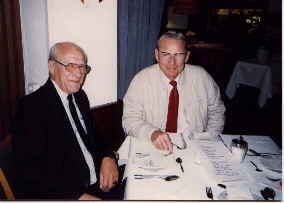 Douglas Hickling (left), son of Jessica Hickling. 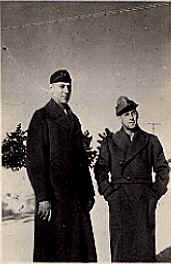 Vere (Tarzan) Williams (right), was a member of Company "K", 157th Regiment, 45th Infantry Division. He joined the National Guard in the Fall of 1938, mobilized in the regular army, Sept. 1940, went through 6 training camps. He then shipped out of Newport News, Virginia for Oran, North Africa. First saw action in Sicily, Italy and France, and almost reached Germany. He received 6 campaign battle stars, was wounded six times, and was the recipient of the "Silver Star", awarded for bravery. Flint Whitlock, author of "The Rock of Anzio", begins the first page of his book with experiences of Vere (Tarzan) Williams. After the war, Sergeant Bacon and Corporal Burns returned home and went about raising their families. Bacon was very successful in the private sector and eventually retired. He now makes his home in upper Michigan. Burns joined the U.S. Border Patrol and died in December 1968 having suffered a heart attack while on duty. 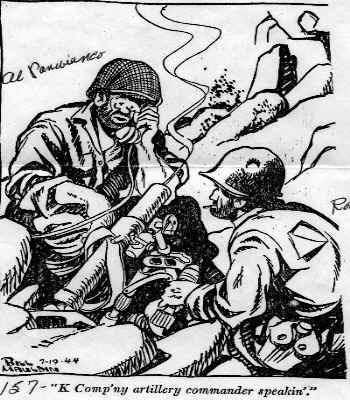 James Burns Jr. has written a book, Friends at Anzio, stories of Bacon and Burns, 180th Infantry, 45th Division. Anyone interested in purchasing this book, please contact James Burns Jr. by email, rjburns@mindspring.com. 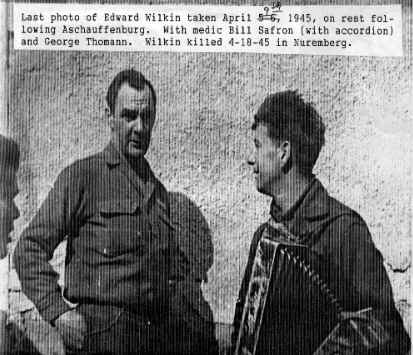 The book makes for interesting reading and tells of many horror and humorous stories of these two men during the war.